The Britax Car Sun Shade blocks sun rays to keep your baby comfortable whilst travelling. 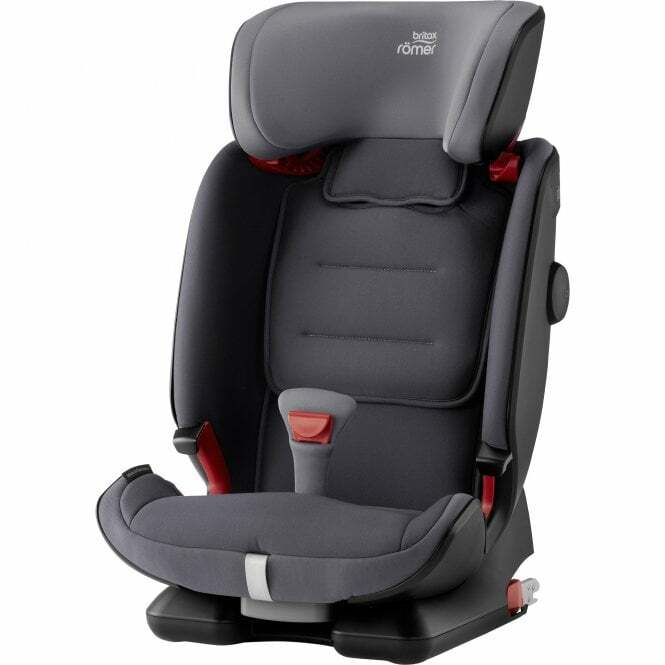 Britax Advansafix IV R Car Seat is a forward facing car seat with side wings that are padded. The seat can be reclined into multiple positions. There is a SecureGuard system which adds a 4th contact point to your car seat belt which makes the Britax Advansafix IV R Car Seat safer for older children by protecting their abdominal area. Why should I choose the Britax Advansafix IV R Car Seat? You will be impressed with how simple it is to adapt the Britax Advansafix IV R car seat into what you need it to be in order to fit your children and your car. Plus, you can rest assured that your child is benefiting from the latest, advanced safety features too. Using a specifically designed ISOFIX fitting, Britax have ensured that through the car seat's installation, it absorbs most of the force from any impact downward into the car's seat. The result of this is a reduced risk of head and neck injury. From 9kg, using the car seat's 5 point harness ensures your little'un is safely but comfortably secured. Installed using your car's ISOFIX anchorage points and the car seat's 'Top Tether'. With generous chest panels (which can be taken out and washed) and v-shaped head rest too, every journey will be a pleasurable experience especially with the choice of three recline positions to suit your child's needs. Once your child reaches approximately 15kg, its easy to adapt the Advansafix IV R as a high back booster seat. This transition is easily done by changing the position of the headrest and storing the harness in the backrest. Britax have incorporated their Flip & Grow lap guard. Simply remove the safety harness buckle, flip it over so the secure guard buckle is above the seat and it is ready to go.The secure guard ensures the straps of the seat belt are positioned not across your child's tummy but at their hips. This cuts the impact of a collision from the front by up to 35%. Britax Advansafix IV R includes side impact protection. This is adjustable to match the position of the seat either on the left or right of the car. The 'side impact protection' device works by reducing the gap between the car and the side of the car seat. It absorbs the force of any impact from the side of the car so that your child remains safe. Stability is a key benefit of the Advansafix IV R. It is provided by 2 anchor points and the pivot link system. Both systems help reduce the risk of a head or neck injury for your child. Britax Advansafix IV R has a removable, machine washable cover which comes off leaving the 5 point safety harness untouched. Who is the Britax Advansafix IV R Car Seat suitable for? Britax Advansafix IV R Car Seat is a group 1-2-3 car seat suitable for children from 9 - 36kg in weight (9 months - 12 years old). This car seat gives you flexibility of use which is so important in the ever-changing daily lives of a growing family. Using either the 5 point harness or the 3 point car seat belt (depending on the size and age of your child), it can be easily adapted to fit children of different ages and sizes without the need to invest in an additional car seat. What are the specifications of the Britax Advansafix IV R Car Seat?